Charley sets to making her famous chicken potpie, a true family favorite that has won her accolades from everyone who has tasted it. Once she has the chicken gravy made, she takes the cooked chicken out of the fridge, pours it into the lasagna pan with the vegetables and tops it with her homemade biscuit topping. She pops it in the oven and turns to make a batch of chocolate chip cookies. Even though she won’t touch a bite of any of this, cooking and baking is easing her conscience a little as her excitement grows. Bake chicken in the oven until cooked. Chop into bite sized pieces. While gravy is cooking, steam frozen veggies until cooked. Combine cooked, chopped chicken, gravy, cooked veggies and the can of diced potatoes in a 9×11 casserole dish. Take biscuit topping and pull it off in biscuit size pieces, stretching it out, just a little, in your hands to cover the top of the guts. Bake in 400 degree oven for 20-25 minutes until biscuit topping is golden brown and cooked through. The “guts” should be bubbling through the topping. This picture is not mine. 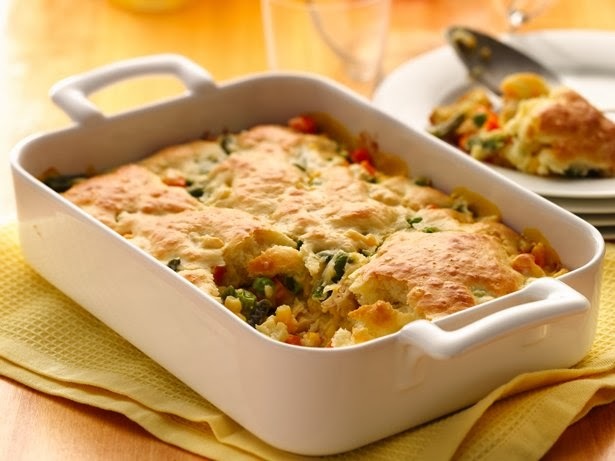 It’s from the Betty Crocker Website but this is what Charley’s Pot Pie would look like! Previous Toddlers come with an instruction manual…why don’t teenagers?